Garador are the largest manufacturer of garage doors in the UK and supply most types of garage doors and also front doors. Below is an overview of the Garador products available. Steel – Steel is by far the most popular material for garage doors in general. Up and over Garador garage doors are made from galvanised steel then finished with a high quality powder coat paint. Steel doors are available in a large choice of designs, both contemporary and traditional. Doors come white as standard but are available in a range of colours. Timber – Nothing compares to the beauty of natural wood. Garador timber up and over doors are made from cedar wood and built on to a ridged steel chassis. This makes a product with the traditional beauty of wood but the ease of operation of a modern door. Cedar wood is an excellent timber from which to manufacture garage doors. It is light in weight and highly resistant to rotting. GRP – GRP is short for glass reinforced plastic but is often referred to as fibreglass. GRP up and over garage doors solve a problem for people who live in close proximity to the coast. People may like the look of timber look of many of the GRP doors. There is none of the maintenance hassle that is required with timber garage doors. PVC – PVC up and over Garador garage doors offer a cost effective alternative to GRP doors. They are a great match for PVC windows. Unfortunately; with Garador PVC garage doors there is a limited range of designs and sizes. Types of operation – Up and over Garador garage doors come with two choices of operation: canopy or retractable. Canopy doors have tracks down the side of the door and a spring along the head rail. When the door is fully open, approximately 1/3 of the door remains outside of the garage forming a ‘canopy’. Canopy garage doors are not suitable for automatic operation. Garador retractable doors have horizontal tracks extending into the garage and vertical springs behind the frame legs. When the door is fully open the edge of the door leaf sits flush with the front of the frame. Retractable Garador garage doors are suitable for automatic operation. We have 7 Garador up and over doors in our showroom. It is possible to park a vehicle close to the door. When opening, the door does not swing out. A sectional door can give full opening height and width. There are no restrictions from lifting arms, handles etc. as you get with an up and over door. Sectional Garador garage doors are available as un-insulated or 42 mm thick insulated. Un-insulated doors are made from single skin steel with bracing on the back. 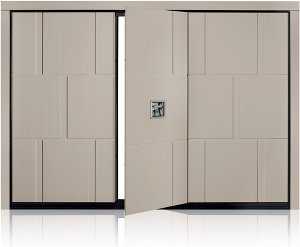 Insulated doors are made from a double steel skin construction with a CFC free foam core. Insulated doors are far stronger, more ridged and give a much quieter operation than the single skin doors. Garador sectional doors come in Georgian panel and linear designs to suit both modern and traditional homes The Linear Medium is the most popular design and we have one of these in our Lancashire showroom. Side hinged doors are a great alternative to up and over garage doors for garages not used for cars. Ideal if the garage is used as a workshop of storeroom. These doors provide quick and easy access. Side hinged Garador garage doors are available in steel and timber. They can have either a half and half or a two thirds one third split. Many of the up and over designs are available as side hinged and come with the same quality powder coated finish. We always provide Garador side hinged doors with door stays. These prevent the door leaves being strained by the wind when open. Garador’s range of operators are perfectly suited and tested to work in harmony with Garador garage doors. The latest generation of Garador operators comes with Bi-Secur technology. This allows you to query the door remotely and check whether it is open or closed. There are 3 models available; Garamatic 9, Garamatic 10 and Garamatic 20. Garamatic 9 is our most popular operator and is suitable for most doors, it has a peak force of 750 N, a soft start and soft stop, a courtesy light and automatic safety reversal. Garamatic 10 and 20 are essentially the same operator. The 10 has a peak force of 800 N, the 20 1000 N. This makes the 20 suitable for very heavy garage doors. As well as the features included with the Garamatic 9, the 10 & 20 also come with a handset which has the Bi-Secur query feature, (this is sold as an upgrade with Garamatic 9). They have high speed operation and a half open function for ventilation. There are other features also. All Garamatic operators have an emergency release function in case of a power failure. Garador’s FrontGuard range of entrance doors are steel leaf doors with an aluminium frame. They are one of our most popular products at Lakes as they give such a great look and performance. The range includes both contemporary and traditional designs to suit any taste. On selected models they are available with the ‘Secured by Design’ stamp. This proves that the doors have been tested and accredited to the Secured by Design security level.